Recently Google announced Google + service, and they are taking Google + very seriously too. I think most of the people are already signup to the google plus service and some of them maybe an active user of it. If you are one them who use orkut,then you many have few/large number of photos or many album uploaded to your Okut account. Think you need to upload or share the same images with your Google plus site. What you will do? Do you once again upload all orkut photos to Google+ manually once again? 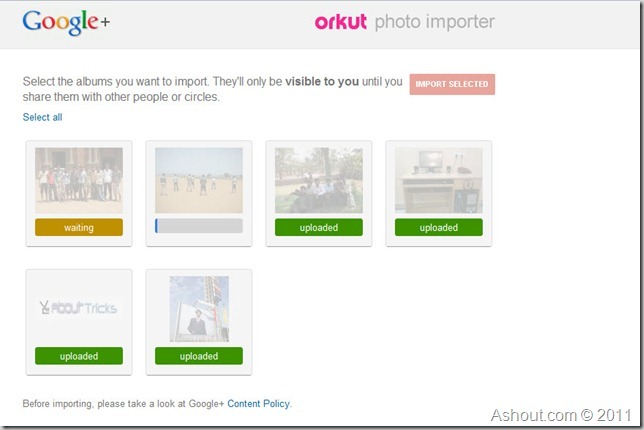 If so, Here is simple solution to upload all orkut images to google + profile easily. Google has recently added new option to our orkut profile to share all our images or album with google + profile easily. To do this just follow few steps. “Share your Orkut photos on Google+” option below the update status window. 2. Just click the button which says “Copy my Orkut photos to Google+ now” button. Once you click the button it will ask which album/photos has to copy to your google plus profile just select the album you need to copy to the google+ profile and click “Import Selected” button. 3. That’s it. Now all your orkut album is available in your Google+ profile within few seconds (It won’t upload all photos once again). If you didn’t find any message when you login to orkut profile, then visit orkut Albums Export page to export orkut albums to Google+ profile. Goolge make good Facility for the orkut user to connect with Google network.